Is Puppy Preschool Worth The Effort? What’s New In Puppy Vaccines? Do I Really Need Pet Insurance? Are rabbits good pets for kids? Have you noticed how many rabbits are scared of people? Rabbits are prey species and unless they are handled gently and frequently from a young age they can have a natural fear of humans. The good news is that the house rabbits we see are as friendly towards humans as any other pet. They have an adorable and unique personality otherwise not seen in the unsocialised rabbit. And a lot more fun for the family too. Read why we don’t advise keeping rabbits in hutches. Hay (grass hay not lucerne or straw) can be bought from pet supply stores and fodder stores. It should be fed daily as well as used for bedding. Hay should be at least 80% of the diet. Tooth problems in rabbits are usually noticed by the rabbit eating less food or trying to eat but the food falling from the mouth. Sometimes, the overgrown teeth can be seen protruding from the mouth but usually, it is necessary for a vet to examine the mouth. If this happens, see your vet. 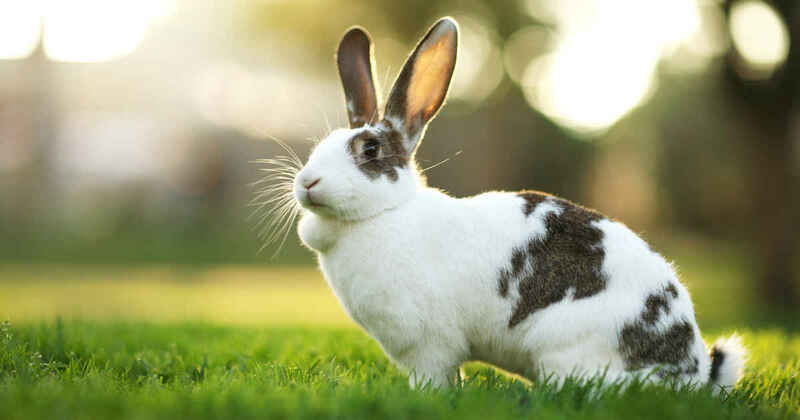 Rabbits are best vaccinated at 4 weeks, then at 8 weeks, and again at 12 weeks or later, followed by annual vaccination against Rabbit Haemorrhagic Disease (calicivirus). As soon as you get your rabbit, contact us for advice. Read more about rabbit calicivirus RHDV2 here. and about the government K5 calicivirus release here. 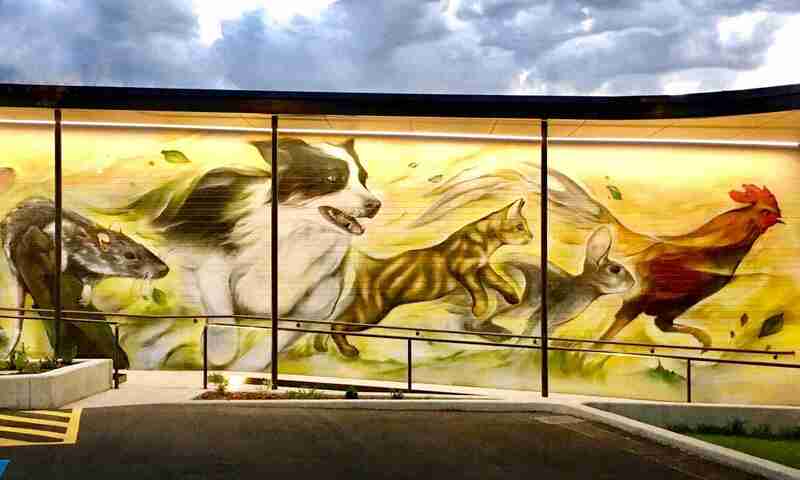 Unfortunately, there is no vaccine available in Australia for myxomatosis so rabbit enclosures need to be fly and mosquito proof and rabbits enclosed from dawn to dusk. Read more about rabbit myxomatosis here. Rabbit lumps are serious, and often fatal. Have a close look at the featured image above. That lump doesn’t look like the usual dewlap of a female. 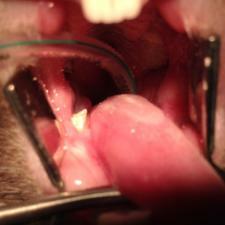 It is probably an abscess and if so, needs immediate treatment at a rabbit-friendly vet. Fractures are very common., usually from falls when startled while being held. They can be repaired just like any other species (we’ve done a lot) but it pays to sit down to cuddle rabbits just in case. Spinal fractures occur in a similar way, but also when rabbits struggle while being held. They have such powerful back legs. Eye Problems include blocked tear ducts from dental issues, conjunctivitis and an infection called encephalitozoon that we mentioned here . Fly Strike occurs in warm weather when faeces are adhered to the bottom. The smell attracts flies who lay maggots. The cause is often a combination of poor diet, poor hygiene and insufficient activity or mobility issues. Ear and Fur Mites are also very common, however fleas are uncommon. 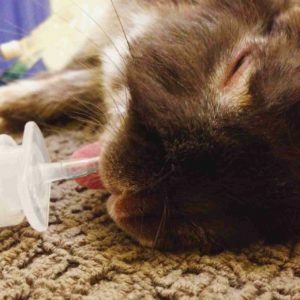 Rabbit skin parasites are easily treated using the products on this page, but often the ear infection also needs special ointment. Worms, however, are almost never a problem. We do not advise the use of wormers in rabbits. Bumblefoot and Sore Hocks are skin ulcers caused by excessive pressure on sensitive pressure points. If not treated early, these infections can extend to the bone. The cause is often found in the housing arrangement or in fixing problems such as obesity or bunny arthritis. Predation from foxes and dogs is one of the most common causes of death. 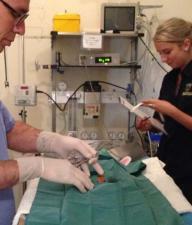 Read about a fox attack on one of our rabbit patients here. Can you see the ear? Rabbits are desexed from 4 months of age. All animals are given a physical examination prior to anaesthesia, and all animals receive potent post-operative pain relief. We find owners are surprised by how little their animal is affected by the procedure, and by how little impact desexing has on their pets. Desexing will improve behaviour in both sexes. Uterine cancer is a very common and serious disorder of ageing rabbits easily prevented by early desexing. Before you book in your rabbit for desexing, read our guide to What to do before a rabbit is desexed. We only use gaseous anaesthetics delivered by endotracheal tube, with full monitoring support; the same as most dog, cat and human anaesthesia. 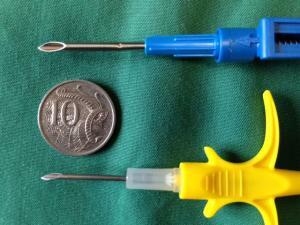 Read our article about anaesthetic safety to learn more. Read our full article about microchips here. All rabbits should have a microchip implanted at some stage early in their life. Rabbits commonly escape from yards and are found a long distance away. Without identification, they are rarely able to find their home. Microchipping can be performed in most rabbits without an anaesthetic but is often done at the same time as desexing. It is standard practice to place an “M” tattoo in the ear at the same time or with the next anaesthetic. However, a tattoo is not considered absolutely necessary. The picture shows the new mini chips next to the older standard microchip. The cost is the same and inserting them causes less discomfort. It is a permanent and safe identification method at a minimal cost.